A New Kind of Security Designed for the Way Software Is Created. Contrast Security Review: CSO MAGAZINE – "One of the most elegant solutions out there for application security." Read the review. Contrast Security Review: CSO Magazine – "One of the most elegant solutions out there for application security." highly agile, without putting the organization at risk. security flaws are automatically identified. Contrast Assess delivers security results as fast as code changes. Because Contrast agents monitor code and report from inside the app, developers can finally find and fix vulnerabilities without requiring security experts. That frees up security teams to focus on providing governance. Contrast Assess deploys an intelligent agent that instruments the application with smart sensors. The code is analyzed in real time from within the application. Instrumentation minimizes the false positives that slow down developers and security teams. Resolve security issues minutes after installation by integrating security into your toolchain. Contrast Assess integrates seamlessly into the software lifecycle and into the tool sets that development & operations teams are already using, including native integration with ChatOps, ticketing systems and CI/CD tools, and a RESTful API. 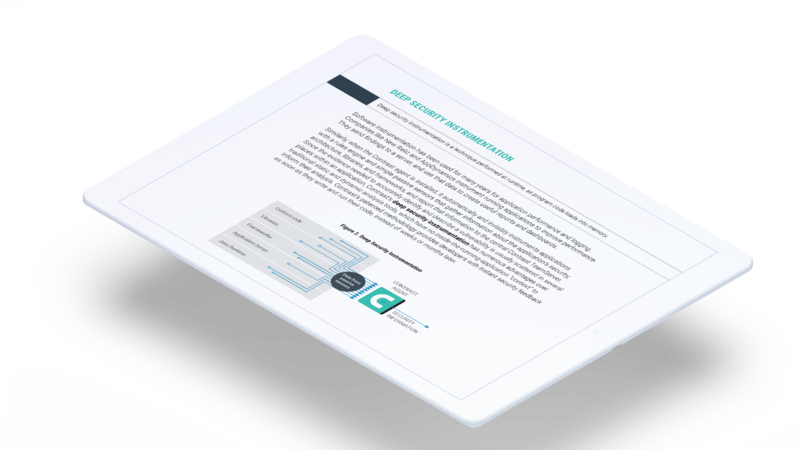 Contrast Assess delivers vulnerability assessment across an entire application portfolio. Results are delivered continuously so development teams can be agile – confidently releasing software as fast as they want, knowing it is secure. Did you know that as much as 80% of software code comes from open source and third-party libraries? Contrast automatically discovers third-party libraries, triggering alerts to known risks. Then Contrast analyses libraries to discover new risks, and provides critical versioning and usage information to help development teams remediate risks. works from the inside out. Discover how Contrast Assess works by deploying an intelligent agent that instruments the application with smart sensors to analyze code in real-time from within the application. In this paper learn how instrumentation works to find vulnerabilities, insecure libraries, and how it compares to other security testing methodologies. Contrast Security is the most accurate, fastest and scalable application security solution in the market. Unlike legacy application security testing solutions, Contrast Assess produces accurate results without dependence on application security experts. Accuracy comes from Contrast's patented Deep Security Instrumentation technology, which integrates the most effective elements of Interactive (IAST), Static (SAST), and Dynamic (DAST) application security testing technology, software composition analysis (SCA), and configuration analysis, and delivers them directly to applications. Contrast Assess produces a continuous stream of accurate vulnerability information whenever and wherever software is run. Development, QA and Security teams get results as they develop and test software, enabling them to find and fix security flaws early in the software lifecycle, when they are easiest and cheapest to remediate. Contrast Assess integrates seamlessly into the software lifecycle and the toolsets that development and operations teams are already using. This includes native integration with ChatOps, ticketing systems and CI/CD tools, and a RESTful API. This seamless integration makes Contrast Assess a perfect fit with modern software development techniques, including Agile, DevOps, containers, microservices, APIs, cloud, etc. Contrast Assess scales because it instruments application security into each application, delivering vulnerability assessment across an entire application portfolio. Every running application continuously produces results in parallel. This model is very different from legacy approaches which require application security experts – a human element that adds an extra step and does not scale. Security Testing Manager, Testing IT Ltd.
Identify Vulnerabilities at the Source. Easily. Early. Be agile, confidently releasing software as fast as you want, knowing it is secure. Get accurate results, produced continuously, delivered through the channel of your choice -- ChatOps, ticketing systems, email, IDEs, etc. Focus on providing governance and oversight because Contrast Assess is accurate, continuous and automated. It works perfectly with microservices, APIs, containers and software built to run in the cloud. No more time-wasting tweaks to inaccurate security products! Build application security into your CI/CD environment with a broad range of native integrations and a RESTful API. Contrast Assess is the only application security tool built from the ground up for Agile and DevOps. Assessing applications is complex, but Contrast security makes it easy. See what the new era of self-protecting software looks like. Contact us to schedule your live demo.